Added by Indo American News on September 20, 2018. HOUSTON: The Classical Arts Society of Houston presented the much-anticipated Carnatic vocalist Sri TM Krishna and his troupe at The Match, on September 8, as its annual Fall Recital. If there was any doubt to Sri Krishna’s stardom, one had only to look at the adoring eyes of the youngsters on stage and the impressive audience turnout, despite being a day filled with vying local events. The concert was in part, a tribute to noted vocalist Sri Ramnad Krishnan, whose birth centenary is being celebrated worldwide this year. Sri Ramnad Krishnan passed away in 1973. The event began with speeches, first a personal fond homage by seasoned local musician Smt Anuradha Subramanian who had part of her musical training under the great singer. She was then followed by Sri TM Krishna who while praising the giant’s inimical style urged a more dispassionate look at the experiences of the gifted singer who was never truly embraced by the public during his lifetime. Sri TM Krishna began his concert with the beautiful composition ‘ O Rangasayee’ in Raga Kambhodhi by Sri Thygaraja. Known for his unorthodox style and presentation, the song started the concert with a slow tempo that built up gradually to showcase the majesty of his voice and sensitivity of his rendering. The second song in Tamil, ‘Jaadhi mada bedhangal Mooda vazhakkangal’- a nod to the singer’s passion for a casteless society- was in Raga Kaanada and written by Bharathidasan. While the singing was rendered with touching nuance and melody, a lot of the latter lyrics could not be heard clearly and the message left incomplete. The rest of the concert continued with an expansive RTP (Ragam, tanam, pallavi). The Behag Raga Tanam was laced with several nuances reminiscent of Sri Ramnad Krishnan and delivered with impeccable technique. The viruttam ‘Kala beda kola beda’ in Ragamalika -Todi, Sahana, Begada and SriRanjani -again evoked the phrasings of Sri Ramnad Krishnan. This was followed by a brisk and delightful ‘Bhuvini Dhasudane’ by Sri Thyagaraja. The rare Raga Ramakali was beautifully handled next in a song by Dikshitar followed by a very touching ‘ChinnanchiruKiliye Kannanmma’ rendered in Sri Krishna’s inimitable style. Just when it felt like the audience was beginning to settle in, it was already time for the last few short pieces and the concert ended with an audience request, a Jaavali, ‘Jaanaro’ in Khamas Raga followed by Dikshiter’s notuswara kirithi , ‘Santhatham Pahimam’ as mangalam. Accompanying artists Shri R K Shriram on the violin and Arun Prakash on the mridungam, both musical stalwarts in their own right, were superb in consolidating the mood and effect of the evening’s performance and even at times helping to pull the pieces together. It was fun to see the artists obviously enjoying themselves while challenging each other. The long pauses in Sri Krishna’s alapanas gave ample opportunity for instrumental expression. Intermittently, Sri Krishna’s disciple on the tambura was also asked to accompany his vocals and though couldn’t be heard was obviously honored to be there. The evening ended almost as quickly as it began leaving the audience wanting so much more. In attendance at the concert were invited guests Mrs. Nancy Allen of Asia Society Texas Center and Dr. Bradley Bailey, Curator of Asian Arts at the Museum of Fine Arts. Also present were area dance and music teachers Pandit Suman Ghosh, Pandit Shantilal Shah, Smt Rajarajeshwary Bhatt, Smt Rathna Kumar and Smt Padmini Chari among others. 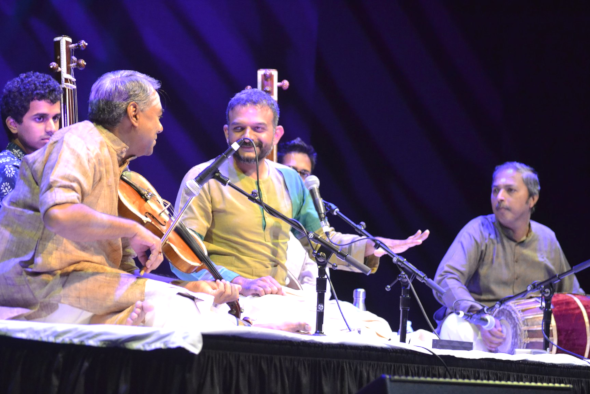 This concert marked Sri TM Krishna’s first stop on his current USA tour marred by controversy over his personal opinions and philosophical differences in the Carnatic music arena. While promoting awareness and interest in Carnatic music to other communities, he has been a blistering critic of the brahmin community’s cultural influence on the genre. Ironically, his main audience is the very community he disparages. TMK’s opinions and social commentary notwithstanding, his music remains pure and exquisite, transcending all manner of differences. Houston was, indeed privileged to have hosted him.